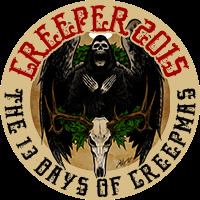 MissMuffcake: Creepmas 2015 - 13 Days Of Holiday Fear! The Spooky Vegan has inspired me to take a stab at the holiday season with Creepmas! Starting tomorrow I will unleash 13 days of creepy holiday fears and cheers. Admittedly my stuff will probably be more on the gloomy and cute side but I might have the mister bring some of his style in a special post here. All Creepmas posts will be tagged so allowing me to blog about other stuff like cats, food and so forth will not confuse your minds - the holiday season is stressful enough right?